Hard science fiction is the literature of change, rigorously examining the impact—both beneficial and dangerous—of science and technology on humanity, the future, and the cosmos. As science advances, expanding our knowledge of the universe, astounding new frontiers in storytelling open up as well. In Carbide Tipped Pens, over a dozen of today’s most creative imaginations explore these frontiers, carrying on the grand tradition of such legendary masters as Isaac Asimov, Robert Heinlein, and John W. Campbell, while bringing hard science fiction into the twenty-first century by extrapolating from the latest scientific developments and discoveries. Ranging from ancient China to the outer reaches of the solar system, this outstanding collection of original stories, written by an international roster of authors, finds wonder, terror, and gripping human drama in topics as diverse as space exploration, artificial intelligence, biotechnology, climate change, alternate history, the search for extraterrestrial intelligence, interplanetary war, and even the future of baseball. 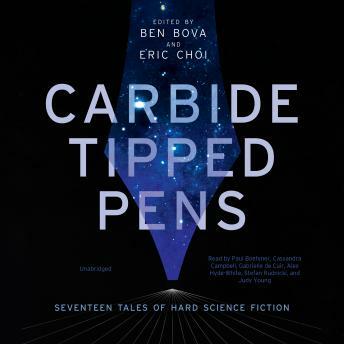 From tattoos that treat allergies to hazardous missions to Mars and beyond, from the end of the world to the farthest limits of human invention, Carbide Tipped Pens turns startling new ideas into state-of-the art science fiction. This collection includes stories by Ben Bova, Gregory Benford, Robert Reed, Aliette de Bodard, Jack McDevitt, Howard Hendrix, Daniel H. Wilson, and many others!